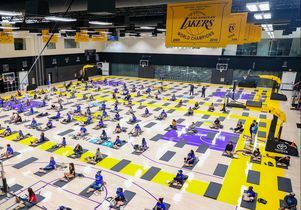 More than 700 children and adults from around Los Angeles learned how they can help cardiac arrest victims at the first-ever CPR Palooza held at the UCLA Health Training Center, Home of the Los Angeles Lakers, in El Segundo on June 2. The free training was hosted by UCLA Health and the Lakers, and taught by instructors from the American Heart Association. The goal was to help people know what to do if they are near someone who suddenly collapses from a cardiac arrest. "I think it's important for everyone in the family to know something about what to do in an emergency situation," said Jennifer Malone, an El Segundo resident who attended with her two sons, ages 10 and 12. "For kids especially, even if they have a little bit of what they learned today, if it's just call 911, I think that's of great value to them."